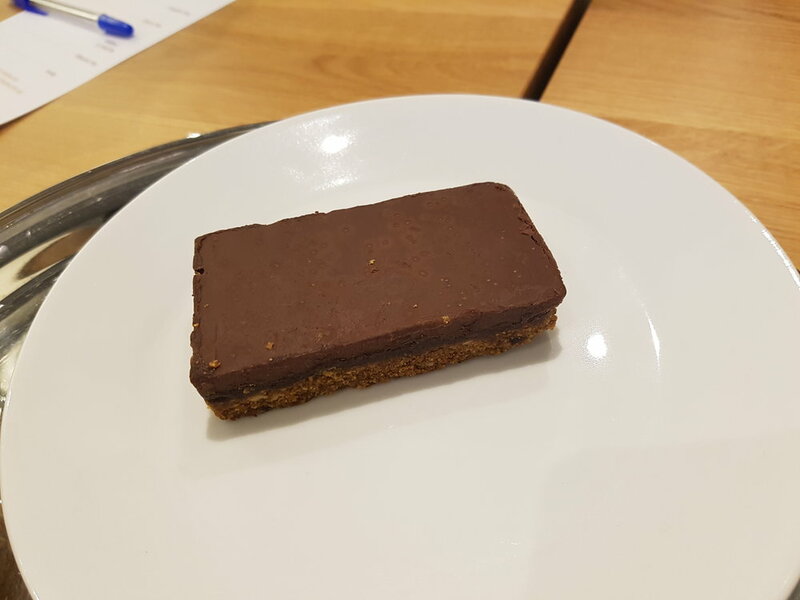 Ahimsa The Vegan Café is Pinner's first vegan café and what a success! When I found out that a vegan cafe was opening in Pinner, (North West London), I was so excited! I've been there about 5 times since it's opened and every time, I'm pleasantly surprised by how much it's evolved. The staff are lovely, the cafe is bursting because it's so popular, the atmosphere is relaxed, and the food is delicious! Enjoy this interview style article, through which one of the owners will you tell you everything you need to know, and more; about Ahimsa The Vegan Cafe. Here are some of the items we've enjoyed during our visits. 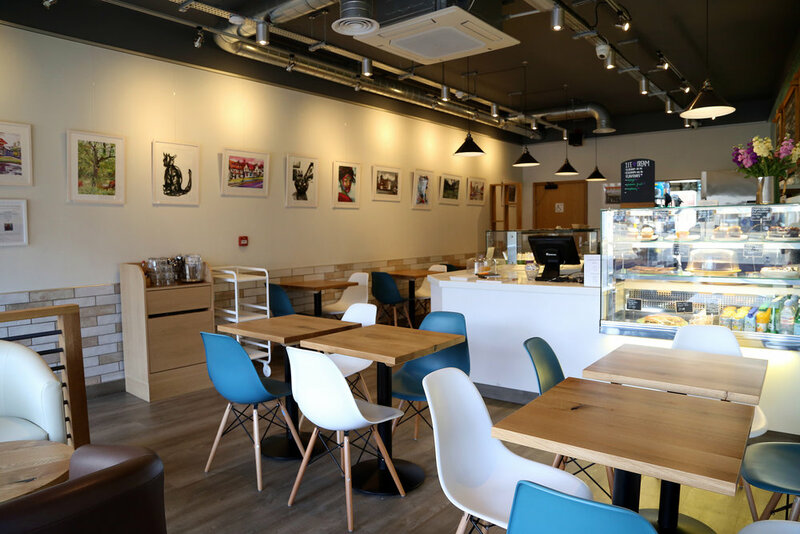 What does Ahimsa The Vegan Café specialise in selling? We mainly specialise in wraps and salad bowls with a choice of hot fillings, vegan cakes, juices and breakfast options. We want to showcase how exciting and tasty vegan food can be because there is a mistaken perception that vegan food is bland, boring and not very nutritional. We also have salad bowls, which consist of rice or quinoa, a hot filling and a selection of salads and toppings. The most recent addition to our menu is a breakfast options. 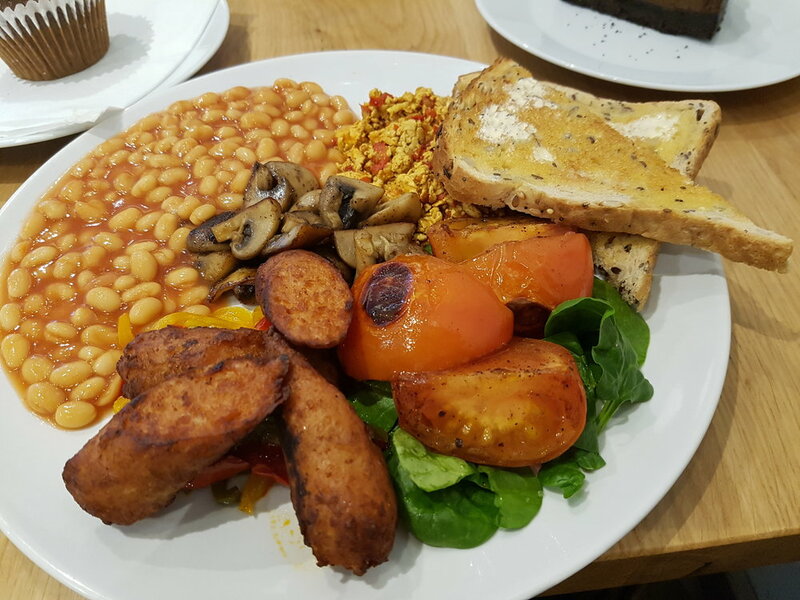 We have a full plated 'traditional' vegan breakfast, as well as, protein packed blueberry pancakes. 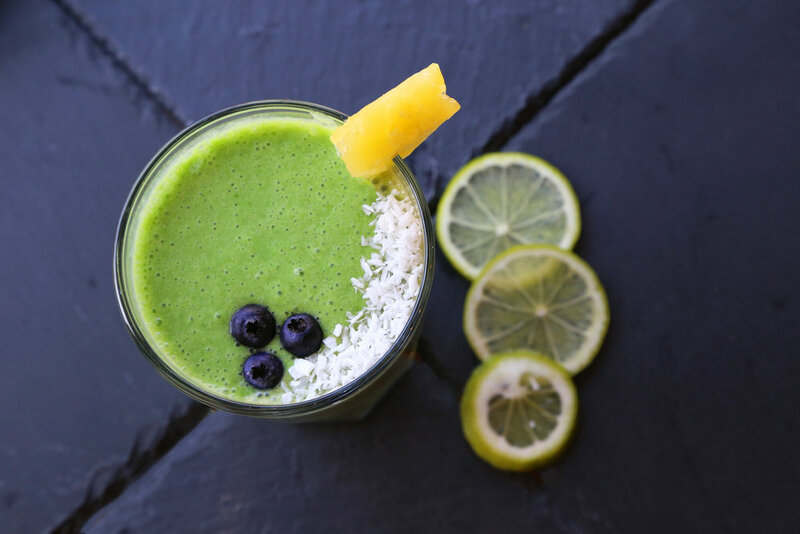 We also offer a selection of fresh juices which are squeezed daily, smoothies, and a full range of barrista coffees and specialty teas. Where is Ahimsa The Vegan Café based? 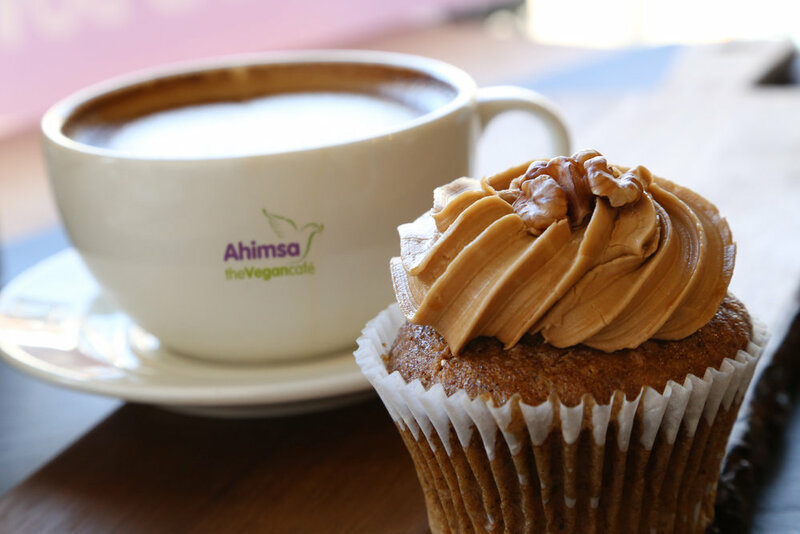 Ahimsa The Vegan Café is based in the heart of Pinner. It's on Pinner High Street, and quite close to Pinner tube station on the Red Lion Parade, which is opposite HSBC Bank. We find that most of our customers are local but a lot of vegans and vegetarians travel quite a long way to try the food. We have recently started a providing outside catering for the local area, and plan to expand this over time. What inspired you to create a business that solely focuses on vegan food? I was inspired to create a vegan café by my friend and spiritual guide, Mohanji. He discussed this idea with me while we were on a trip to Nepal and Tibet in the summer of 2014. He has been constantly highlighting the plight of animals and their treatment in the food industry, urging people to move away from meat, fish, eggs and dairy in order to prevent the exploitation of animals and lead a healthier life. However he was very concerned that there was a perceived lack of options for vegans. His desire was to inspire the creation of healthy vegan fast food outlets across the world, so that there is a larger choice of options for people who wish to pursue a vegan lifestyle. How easy is it for you to source vegan and cruelty free ingredients? Using vegan ingredients tends to dramatically reduce the cruelty involved in our ingredients. Vegan ingredients are relatively easy to come by nowadays with the popularity of vegan food growing, especially in the UK. Fresh fruit, vegetables and beans are freely available. We did find it difficult to find vegan quorn when it was first released. However, it is now being stocked at major supermarkets and wholesalers and it's no longer a problem. For someone who hasn't visited your cafe before, and are indecisive about what to buy; what are most popular items? The most popular item is the falafel either in a wrap or salad bowl followed by onion and garlic free chilli tofu. The falafel is made from chick peas which have been soaked overnight. They are prepared using our own recipe and are freshly fried. Our organic vegan cakes are also a big hit, especially the chocolate muffin, the sugar free Apple and Cinnamon muffin and the carrot cake. The freshly made ABC (apple, beetroot and carrot) juice and power smoothie are very popular drinks. Is Ahimsa The Vegan Café owned by, or in partnership with, another company that tests on animals or sells non-vegan products? No. Ahimsa The Vegan Cafe is owned by Ahimsa Vegan Limited, which has four directors, myself, my sister in law and two friends. Tell me a bit about yourself before you launched Ahimsa The Vegan Café? I started my vegan journey when I was working at Great Ormond Street Children’s Hospital as a Biomedical Scientist in the year 2001, at which point in time I had been vegetarian for about 10 years. One day I got chatting to a lady who worked in the same lab who asked me why I was vegetarian. When I said I was vegetarian because I was concerned about cruelty to animals in meat production, she proceeded to ask if I had considered the cruelty involved in milk production. I had absolutely no idea about the cruelty in dairy farming! She gave me various leaflets and books from the vegan society which were very informative and I simply couldn't ignore it. I started to eliminate dairy products from my diet from that point on and eventually became a vegan. By profession I am a Biomedical Scientist and I currently manage the Specialist Clinical Biochemistry laboratories at Imperial College Healthcare NHS Trust. I have been in the profession for 33 years and have worked in a number of hospitals, both here and abroad. Outside work I actively participate in a number of voluntary projects and in 2012 formed a small registered charity called Mohanji ACT Foundation which helps to provide relief to people in need of food, shelter, medical aid and education both here and abroad. The charity also supports some animal welfare projects. I am also very interested in meditation and run meditation sessions locally in Rayners Lane. Although I still work full time for Imperial College Healthcare NHS Trust, I love spending time in the café, and I really enjoy meeting our customers. For me, the creation of the vegan café is a dream come true! What is your vision for the future of Ahimsa The Vegan Café? My vision for the café is to create a place that inspires people to eat more vegan food, and therefore less animal food. This will benefit them, the animals and the environment. I would like to see more and more branches of Ahimsa The Vegan café open and hopefully inspire the creation of other vegan businesses across the globe, with the aim of creating a better world for ourselves and ALL the inhabitants of this planet. Times have changed! Eating out and being able to order a vegan dessert is no longer a novelty! If you would like to read reviews, recipes, tips, news about vegan businesses and more, sign up for Plant Shift's monthly newsletter here. Woodys cafe: you won't be disappointed!